Manchester United boss Jose Mourinho claims he loves being a football manager more than ever, despite his side's turbulent season. 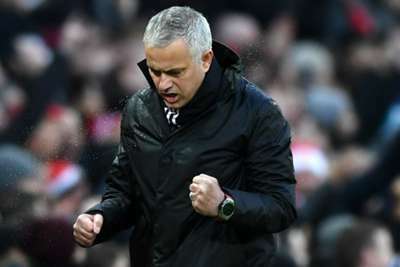 Mourinho has cut a frustrated figure for much of the campaign, with United sitting sixth in the Premier League, well adrift of top two Liverpool and Manchester City ahead of Sunday's high-profile clash with Jurgen Klopp's Reds at Anfield. But the 55-year-old insists the challenges from the first half of this season have made him enjoy the role more than at any other time before. "Yes, more than ever," Mourinho said when asked by Sky Sports' Soccer AM whether he still loved being a manager. "Because it is more difficult than ever. [It has not gone] as good as we thought. But I predicted in the summer that the season was going to be very difficult for us. "I felt this from the summer, our second position last season was a fantastic achievement, and people thought that because we finished second, the next season you will be in a situation where you are going to try to do better, and to do better than second is to be champion. "But I thought that the situation was not that, and I thought the second position was really a fantastic season by all of us, and that this season was going to be very, very difficult, because the teams that were behind us, potentially shouldn't be, and on top of that, they had a great improvement in their teams." "A glorious goal from Ryan Giggs." "A free-kick struck to perfection." "Oohh what a screamer — Rafael sends the United fans wild!" "Sensational goal. That is one of the great United goals at Anfield!" Mourinho was reluctant to name Klopp's current side as the best Liverpool team he has faced, as he would not be doing justice to Rafael Benitez and the Reds players who won the Champions League in 2005. Commenting amid a debate between the pair over the importance of trophies, he continued: "I played against a Liverpool that was European champion. "I don't know if it was better or not better; I know the other team was European champion and that this team won nothing. So I think I have to respect the ones that did it, and I have to respect the ambition of the ones that didn't. "In the end it is about respect, but I would expect maybe Rafa, [Jamie] Carragher, Steven Gerrard, would expect them not to be happy with me if I said this team is better than that team! That team was European champion." As United boss, Mourinho's two meetings against Liverpool at Anfield have ended in 0-0 draws.